At SQLdep we were losing time of our dev team as well. It was nothing unusual to go through a query written by somebody else which had 500 hundred lines with several nested subselects. The catch is: your fastest developer spends 10 times more time on such query analysis then a novice reading a diagram. The SQL standard is here for 3+ decades and yet no productivity tool replaced such obsolete manual code analysis. Not acceptable. Since we pride ourselves in reverse engineering SQL queries we had an ambitious goal to solve this for all the developers globally. Basically establish a new global industry standard of how the SQL code should be treated. 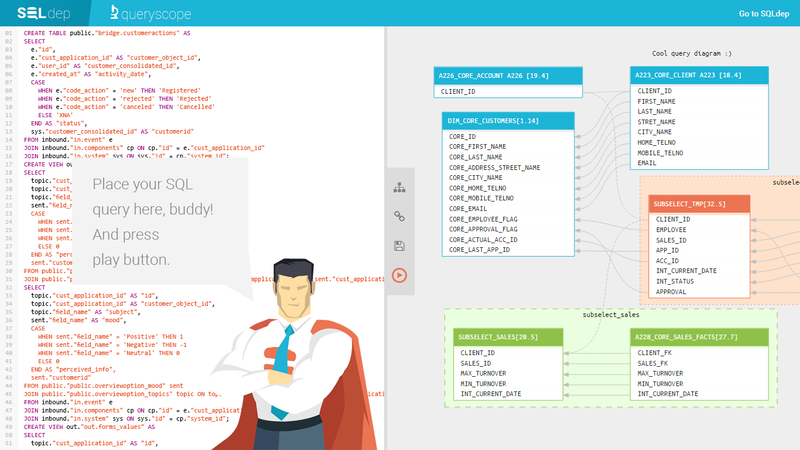 We are launching a private beta of SQLdep Queryscope in 5 weeks. You just copy’n’paste your complex SQL query and instantly get the diagram with the dependencies back. This no-brainer will save 30 minutes a day for everybody working with SQL. Sign-up yourself or your dev team here or contact us at join@sqldep.com. We will not spam you. We promise.